The first thing I wondered after we landed was why things looked foggy. I thought of pollution and lack of sleep. Alva also saw foggy, even inside the terminal. We exchanged and pre-paid 370 rupies (6 euros) for a taxi to take us to our CouchSurfing host. We are in a remote land in the middle of the night, and in front of us this micro-van with no seat belts and a driver with a scarf around his head. All windows have Nike logos, including a big logo in the middle of the front windshield. We drive at fast-horse speed in a road while cars around us honk and leave us behind. We were still discussing whether it was pollution or fog until we were lost in it. 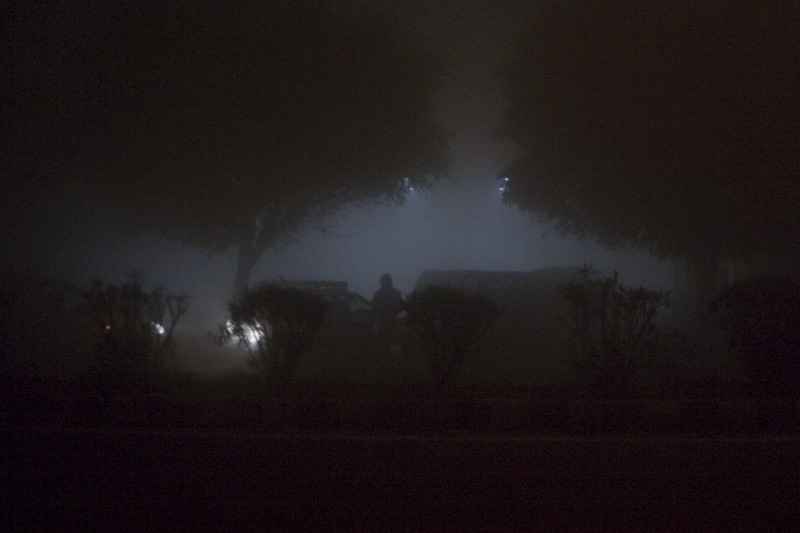 One couldn’t see farther than 3 meters away, which made the drive much more mysterious. Our driver couldn’t find the place, so he stepped out several times, hands in his pockets, head covered in his scarf and asked drivers, people walking, riding bicycles and motorbikes. They all pointed in different directions with their straight arms in a surreal world illuminated by some street lights. When a bike passed us it soon disappeared like a ghost. At times we would drive in reverse to find the road again because ahead of us the road would not continue. It felt like stretching our arms and using our hands to touch the world, because our eyes couldn’t see a thing. We used a flash light to illuminate signs on the sides of the road until we found it. We had no idea of where we were. Satyavrat welcomed us very early in the morning, smiling and very awake. After a tea and some talking we went to bed.